PSF Spain proposed shows and workshops for Internally Displaced Persons (IDPs) in Colombia, mainly in Bogota and Buenaventura. In September 2015, Clowns Without Borders Spain went to Colombia to perform 12 shows for 19,400 people. In January 2015, Clowns Without Borders Spain went to Colombia to perform 24 shows for 2128 people. In April 2014, Clowns Without Borders USA went to Colombia to perform 14 shows for 3050 children in several schools. In October 2014, Clowns Without Borders Belgium implemented a project in Colombia and Venezuela. 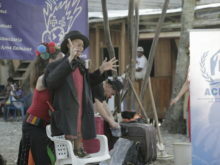 In August 2014, Clowns Without Borders Spain went to Colombia to perform 19 shows for 2985 displaced people in Nariño and Putumayo. In March 2014, Clowns Without Borders Spain went to Colombia to help improve the mental and emotional health of children displaced by the armed conflict. They performed 17 shows for 3315 people. In 2013, Clowns Without Borders USA started their fourth year of collaboration with the Colombia based clown groups Cali Clown and Pasos de Payaso. They mostly did workshops and clown trainings, for 300 people in total. In 2013, Clowns Without Borders USA started their fourth year of collaboration with the Colombia based clown groups Cali Clown and Pasos de Payaso. They mostly did workshops and clown trainings, for 250 people in total.